Today I Wrote Nothing: It's Manchester Monday! 1. I am going to eat Bundobust. 2. I am going to see my friend Hannah's new home. 3. I am going to meet my friend Hannah's new kitty. 4. I am going to eat Bundobust again. Katie and I are taking a road (via train) trip to see fashion exhibits all through the north of England this week. She knows everything there is to know on the history of fashion - not to mention has a graduate degree in the subject - so this is research for her, and I can do some of my own work while I'm up there. We're hitting Manchester, Sheffield, and a random, exciting-sounding place called Barnard Castle, which will take an arm and a leg and twenty buses to get to. That's how you know it's going to be special. 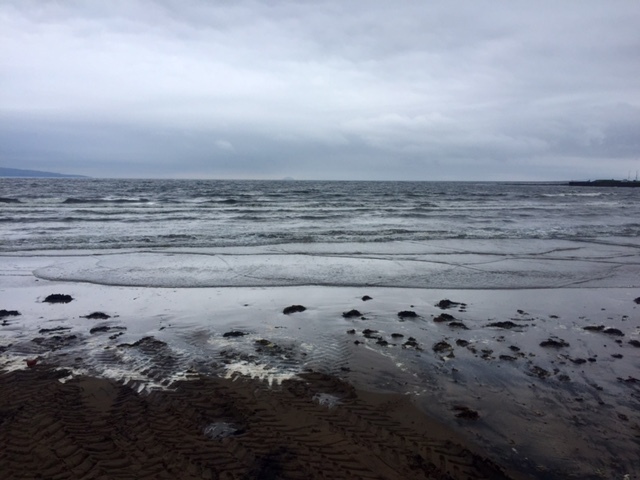 Speaking of, check out this cold, wet, desolate beach in Troon, Scotland. We had lunch there yesterday at a terrific seafood restaurant on our way back to Glasgow. Left the car for a record 26 seconds to take this photo before sprinting back, shivering. Cold beach is COLD. Okay, time to head to the train station. I always try to get there at least three hours early because my worst nightmare is having to sprint for a train. I have done it too many times to count, and I gotta say neither me nor my seatmate has ever appreciated my sweaty panting as I lunge into the carriage and flop around dramatically. Best to get there early, kill time by buying something I don't need from Boots, and then shift uncomfortably from foot to foot for another fifteen minutes watching the listings and avoiding stampedes. See you from the northside!